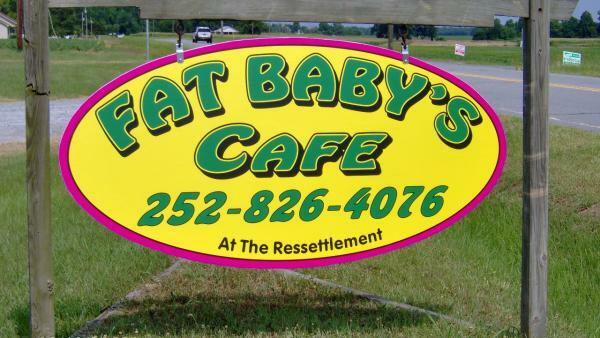 Fat Baby’s Café (formerly known as The Resettlement Café) is located on Tillery Resettlement Farm #35. This property was reclaimed by the Concerned Citizens of Tillery (CCT) in 1992 in order that the Tillery community would have a place for a quick sandwich and perhaps some forgotten items at the grocery store. Except for a few months, there has been an operating cafe in the building since the fall of 1994. Fat Baby's Cafe will help keep the story of the Tillery Resettlement Farms Project alive, drawing visitors to the café and to the Remembering Tillery History House. Fat Baby's offers a wonderful Southern breakfast menu, as well as a lunch menu that includes a daily special and such items as The Fat Baby (their signature hamburger), Devil Dog, onion rings, fries, good ol' Southern sweet iced tea and much more!